Download the Nebraska rental agreements in order for a landlord and tenant to come to a binding arrangement for the use of residential or commercial property. After a potential lessee views the property the landlord will usually ask for their credentials through the rental application. A small fee may be associated with the verification process and once complete a contract should be written according to Article 14, Landlord and Tenant. Rental Application – Used by a landlord when finding out about a potential tenant’s past and current employment, references, and background. Commercial Lease Agreement – For the use of property to be utilized for a business-related use. Lease with Option to Purchase (Lease to Own) Agreement – A standard contract with an added provision that lets the tenant purchase the home at their request. Month to Month Lease Agreement (§ 76-1416) – Also referred to as a tenancy at will and can be terminated with at least thirty (30) days’ notice. Room Rental (Roommate) Agreement – A shared living situation that creates rules for how the common areas shall be maintained along with how is responsible for which expenses. Standard Residential Lease Agreement – For a fixed term, usually one (1) year, between a landlord and tenant for any type of livable dwelling. Sublease Agreement – The act of renting space that is already under agreement by a tenant. 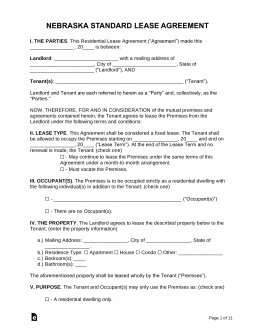 Termination Lease Letter – Provides thirty (30) days to either the landlord or tenant to terminate a month to month contract. Identity (§ 76-1417) – Landlord must disclose in their contract all persons allowed to enter the premises in addition to an official address for notices. Lead Paint – Per federal law, all landlords/managers of residential units constructed before 1978 must inform their tenants with this document of the hazardous material located within the layers of paint. Any chipping of falling paint must be reported by the tenant to the landlord/manager. According to § 76-1423 all property owners, managers, and agents must give at least one (1) full day’s notice before entering the premises of the tenant. Maximum (§ 76-1416) – The lessor may request up to one (1) month’s rent. If the tenant has a pet no more than twenty-five percent (25%) of the monthly rental amount may be charged as an additional fee. Returning (§ 76-1416) – All funds must be returned to the tenant within fourteen (14) days of move-out.